Today is my Mom's 71st birthday. I've not sent her a card and will not be calling her later, in fact I don't even have whatever number she now has. I feel like a terrible daughter, but I'm working on that because I know that having set this boundary with my Mother is the best choice for the sake of my health and they health of my marriage. I wisely scheduled a visit from friends for lunch and therapy this afternoon. 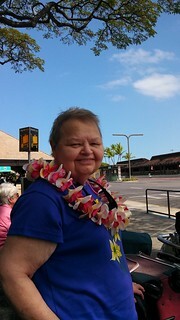 A year ago we were trying to make a celebration in Hawaii for Mom's 70th birthday, an age I never expected her to see. Even though we'd made all the arrangements and took special care, I was left feeling like Mom found her birthday a let down. On her birthday itself we went out to a restaurant where we could all get tasty food and she could have the fish she had said she was craving. She'd have rather gone to a different restaurant, but knew it would leave CK and I with no real choice for something we could eat. Later she'd make a point to tell me how the fish at a restaurant we like wasn't good, in fact she'd tell me at least a couple more times while in Hawaii that her birthday dinner wasn't very good. The travel back home was miserable. I feels like things started to deteriorate rather quickly after that trip. Mom's increasing dissatisfaction in living with us; snide comments escalating to sharp words. Again overhearing her telling friends how it wasn't what it seemed here, that we didn't really take good care of her or make anything nice for her to eat or special dishes. Worse, her intimating to people that she felt I was misusing my access to her bank account. Attempts to take her out for lunch on weekends were spent in near silence, her eating but not really interested in engaging with us at all. When Mom came to live with us I still had this desperate hope that I could really help. I had an even more tightly held hope that my Mom wasn't as bad as I thought, that some of my tense, defensive behavior toward her wasn't warranted. Seeing Mom through the lens of CK's view, free of my history, would let me heal some of that distrust that came up for me. Only that turned out not to be the case, not entirely and not how I hoped. True, we managed to tremendously improve Mom's health. She was in better health than she'd been in for a few years. She was in much better health for making the transition to an assisted living facility. One of the things that hurts is finding out that Mom didn't really want her health improved, she didn't want to let go of her personal mythology that her health was an insurmountable obstacle and she a helpless victim of her bad health. She resented that careful blood glucose monitoring and insulin adjustments, along with a healthier, vegan diet improved her health noticeably. The rest of it, the harder part, is how quickly CK saw the narcissistic, petty, ill person I'd been raised by. Not only was my feeling the need to defend myself warranted, it needed to be bolstered by setting the kind of boundary I've now set. As painful as this has all been, devastatingly so, I know I wouldn't have been able to see my Mom and my childhood quite so clearly if we hadn't moved Mom in with us. I was correct that in changing my view by seeing her as CK sees her would teach me a lot, the sad part is that it wasn't what I was hoping for. It wasn't that changing my stiff interactions with her would improve anything, not in the long run, since my Mom has never really wanted a relationship with me. The only relationship that is possible with her is the one where I'm not me, I'm her "miracle daughter" who takes care of her every selfish need. The mirror of the person she wanted to be. That explains it so well, that she expected me to mirror back to her the girl she had wanted to be. Between trying to force me into becoming the person she wished she'd been, and either subverting and punishing me for asserting my own identity, it makes sense. When called on this behavior she attacked us. I wisely scheduled a visit with one of my therapists today. She asked me what it was I was losing by sticking with my boundary-setting not contacting her. I thought about it a lot, I mean I'm clearly "losing" many things that do not further my life or my health. What is it that I feel loss for, what do I grieve, that's what I thought about. I finally replied that I was losing the fairy tale; a mother who cherished, supported, and believed in me. A mother who cheered me on as I made my way and who would always have my back. The kind of mother I see so many friends write about having. I have to set that particular hope aside so that I can move forward with healing and becoming the person I want to be. I can still hold her in my heart, sending thoughts of loving-kindness her way along with my earnest wishes for her to experience peace and happiness, or even just contentment. I can feel great compassion for her inability to move towards health, but I cannot see her. Having compassion for her does not mean I set aside my own health or sacrifice my relationship with CK.